Everyone who buys them has the same thing as the next student (colors may vary). I don’t have to go on a wild-goose chase to find the extra-ginormous white paper that none of the stores sell (even though it’s on the supply list). It’s less expensive, especially if you factor in the stress of searching for that mythical white paper, the gas used, and the torture of listening to your child debate over which color scissors or ruler or pencil bag–Just pick one already! It helps the PTA (every penny counts). Two folders plus tax: $1.08. In elementary school, there are plenty of people out there who let their kids be individuals and pick out what they want. *rolling eyes* Check to be sure those supplies aren’t going to be used collectively. However, the math, music, and Spanish teachers don’t include the items they want to use, which means another shopping trip after school starts. “What do you mean you need two more binders, five more spirals, six boxes of tissue, and graph paper? Those weren’t on the list.” Yep, eighth-grade additions last year. And yet, I’ll be buying the first grade kit for my little one this year. Sigh. On the other hand, preparing for high school was easy. We have so much stuff on hand that we didn’t need to add pencils, pens, paper, and highlighters to our overstocked office supply store house. Our shopping list was short. A binder, spirals, and folders. Should be easy. We went to Target and spent about a minute picking out a binder and the spiral notebooks in the acceptable colors. Then we spent another 10 minutes searching for folders with brads (or prongs, as Target called them). Finally, a very helpful employee said that they were completely out and wouldn’t get in any more, but the store on the other side of town had over 100 in stock. I had flashbacks from the year when we changed schools and missed ordering the supply kit. I went to three or four different stores to find the white paper that was big enough for a giant to use for origami folding. So, I appealed to her that it was silly to waste gas for two folders. She relented. When we arrived, I remembered that I disliked the store, too. Two folders were chosen in record time. While we waited in the slowest express line ever (no self-serve registers at this store), I realized that I had no cash. There was no way that I was going to put $1 on the credit card. 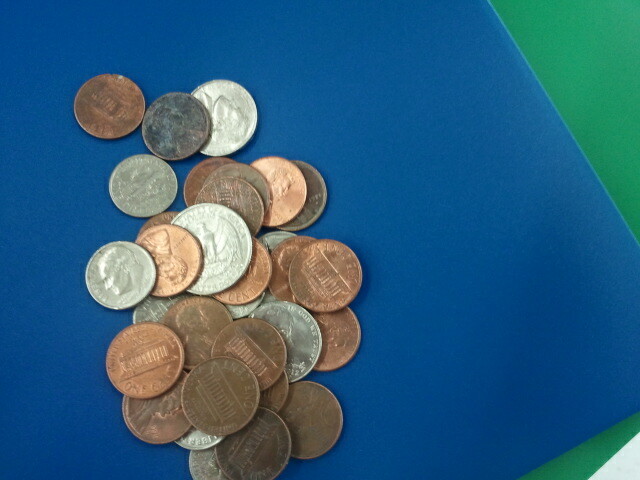 I dug through my purse bottomless pit until I found every last coin. I had exactly $1.12. One was an old wheat penny, and that went into my daughter’s pocket for safe keeping. All I needed was $1.08, and I was officially finished shopping for high school supplies. Woohoo! I even had a few coins left to my name. At least until the math, music, and Spanish teachers send their lists home. Liza Caruthers tells it like it shouldn’t be from a teacher’s perspective. Julie Glover describes her high school experience compared to her son’s. Piper Bayard got me thinking about first days of school. Until someone creates an insta-clone machine, give me Pauline B. Jones’s minions to help get everything done. Not school-ish at all, but I need minions.